Gamescom is officially underway in Germany, and the game announcements are coming in! Today is Nintendo’s conference and we’ve finally gotten word that Rocket League is officially coming to the Switch Holiday 2017 – only a couple months away! To celebrate the release, Psyonix has created three exclusive cars for the Switch version. 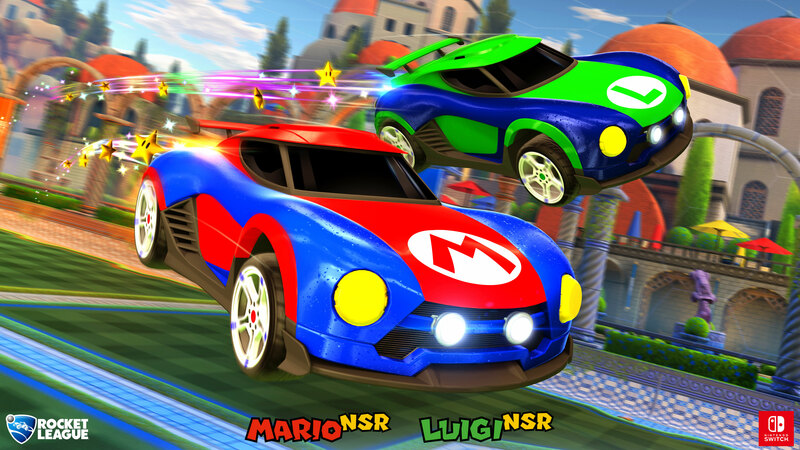 Introducing the “Mario NSR” and the ‘Luigi NSR,” two colorful and cool cars that feature the color schemes of the famous plumber brothers. There might even be a themed boost trail to go with it – a rainbow boost that scatters the Mario stars all over the place! But perhaps the coolest car of them all comes after the Mario cars. A new car based on the legendary intergalactic bounty hunter is coming! That’s right – “Samus’ Gunship” is a incredibly slick battle car that features the trademark yellow gunship colors and the green visor-esque cockpit window. The gunship is sporting a bright pink boost trail that’s modeled after Samus’ Wave Beam. The best part about this announcement is that these cars will be free DLC when the game launch this Holiday season. Of course, this also means that the Nintendo cars will be exclusive to the Switch so if you’re playing on the PC or any other console, sorry! In addition to these sweet car skins, Psyonix has also promised that the Switch version will have exclusive customization items. Does this mean that there will there be toppers, wheel, and trails exclusive to the Switch version? We’re hoping for more Nintendo themed stuff, if that’s the case! We’ll have more news about the Nintendo Switch version of Rocket League as we get closer to its launch date.